As we all know, the outbreak of war in 1939 put an end to the Seven marque but experts and Austin aficionados can still argue over what would have happened if World War 2 hadn’t intervened in the Austin Story. In 1935, whilst sales of the Seven in all its forms were still extremely buoyant, Austin was starting to lose out against their bitter rival, Morris, who had managed to double their output over previous years. Austin’s biggest seller was the Ruby de Luxe but other Sevens were fairing less well (the 2-Seater was still on sale with its chrome rad but sales were less than a thousand and sports models down to a couple of hundred!) 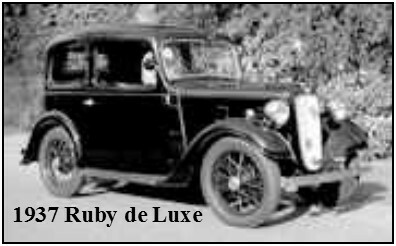 Whilst the basic Ruby was the cheapest 4-seater car on the market at £112 (£6,600), the Ford 8 at £115 was a serious competitor to the Ruby de Luxe at £125 and the Pearl at £128. In 1935 the poor little chrome rad 2-Seater finally got its cowled radiator and sold at £102 10s (£6,000). It’s no coincidence then, by 1937 the Seven had to be updated but, with the effects of the depression still looming in people’s memories, there were no plans for a new model Seven – only essential tweaks. These tweaks included: a change to negative earth, a 3-bearing crank, a higher compression head, a new clutch and Girling brakes. 1937 was the beginning of the end for the Seven marque – the Nippy was removed from the catalogues and there were no changes to be made to the Sevens’ specifications. The basic Ruby was priced at £131 (£7,200) and vans sold for £115. However, a brand new car was introduced alongside the Sevens – the Big Seven. At the press launch in July 1937 Lord Austin said “Today is an auspicious one for the company as we are introducing for the first time since 1922 another small car, the Big Seven. …… I should like to emphasise that the Big Seven is an addition to the Austin family and does not in any way supercede the famous ‘Baby’.” Oh no? The end of the Sevens was surely announced in this speech. In 1937, sales had started to fall off but by 1938 things were getting serious with Austins alone suffering a 30% drop in all sales. 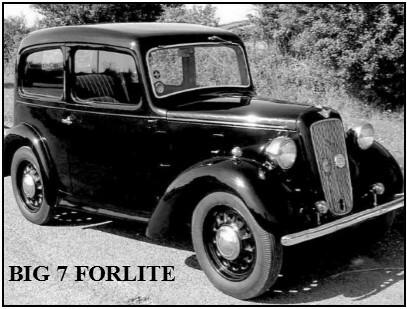 Prices of the basic models were reduced slightly (£125 for the Ruby) and so it is no surprise that in March 1938 the Sixlite and Forlite Big Sevens, followed a new Austin 8 in February 1939, were introduced as a direct replacement for the Sevens. 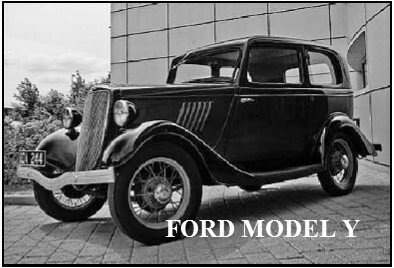 In 1938 some Seven cars and parts were sold off to the Reliant Engineering Co., the last Seven saloon left the works on 17th January 1939 and the last ever Seven to be produced was a van in March 1939. AT THAT TIME . . .
"At long last, I am able to say a few words of my own. I have never wanted to withhold anything, but until now, it has not been constitutionally possible for me to speak. 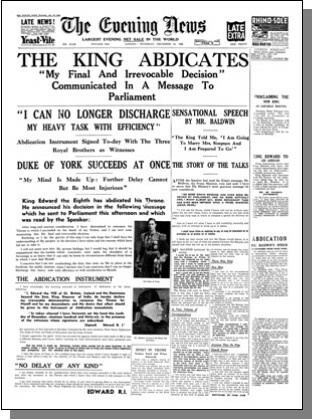 A few hours ago, I discharged my last duty as King and Emperor, and now that I have been succeeded by my brother, the Duke of York, my first words must be to declare my allegiance to him. This I do with all my heart. …. You must believe me when I tell you that I have found it impossible to carry the heavy burden of responsibility and to discharge my duties as King as I would wish to do without the help and support of the woman I love. …. I now quit altogether public affairs and I lay down my burden. It may be some time before I return to my native land. God bless you all, God save the King!" 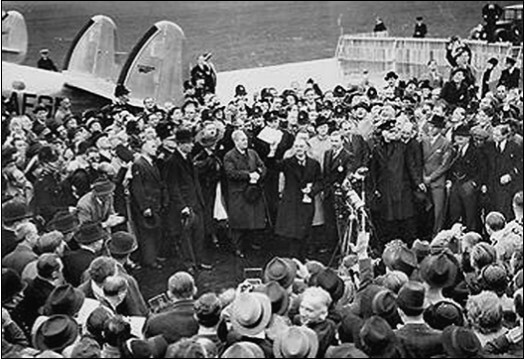 The day following the broadcast he left Britain for Austria. At the same time as Britain was facing its greatest attack on the monarchy, Hitler was returned as Chancellor with a 99% share of the votes, Germany invaded the Rhineland, Hitler & Mussolini created the Rome-Berlin Axis and the Spanish Civil War began. In America, Roosevelt was re-elected President with a landslide. Chiang Kai-shek, Chairman of the Nationalist government of the Republic of China declared war on Japan. In response to the worldwide gathering of storm clouds, Chaplin produced and starred in the film “Modern Times” whilst popular songs ignored all about them with such frivolities as “It’s De-Lovely”, the “Wiffenpoof Song”, “I’m an Old Cowhand” and “Pennies From Heaven”. 1936 saw the controversial Olympic Games held in Berlin where black athlete Jesse Owens achieved international fame by winning four gold medals: one each in the 100 meters, the 200 meters, the long jump, and as part of the 4x100 meter relay team. Hitler walked out. George VI was crowned King of the United Kingdom and the Dominions of the British Commonwealth, dropping for the first time the title of Emperor. The Duke of Windsor married Mrs Simpson at Château de Candé, near Tours, France and no members of the Royal family were allowed to be present. Neville Chamberlain took over as Prime Minister when Stanley Baldwin retired. In response to China’s attack, Japan invaded the Chinese mainland. Lord Halifax met with Hitler beginning a policy of appeasement. In the Arts field, George Orwell wrote “Wigan Pier”, Steinbeck “Of Mice & Men” and Kenneth Roberts “Northwest Passage” whilst Picasso painted his iconic work “Guernica” in protest at the Spanish Civil War. In the film world, Walt Disney’s “Snow White & The Seven Dwarfs” was the first full-length cartoon picture and the first produced in full colour; Sabu appeared as “Elephant Boy” and Garbo was “Camille”. Popular songs included “The Lady Is A Tramp”, “Whistle While You Work”, “A Foggy Day In London Town” and “I’ve Got My Love To Keep Me Warm”. 1937 saw the first treatment of diabetes by insulin, Frank Whittle’s jet engine, the Hindenburg airship disaster, and the first Butlins holiday camp in Skegness. Germany marched into Austria and Chamberlain met Hitler signing the Munich Agreement conceding the Sudetenland region of Czechoslovakia to Germany giving his now infamous “Peace In Our Time” speech on his return. In the Arts, Daphne du Maurier wrote “Rebecca”, Graham Gree ne “Brighton Rock”; the radio broadcast of H G Wells “War Of The Worlds” caused widespread panic in America. Films include “Pygmalion” and Hitchcock’s “The Lady Vanishes” whilst popular songs include “The Flat Foot Floogie With a Floy Floy”, “A Tisket, a Tasket”, “Jeepers Creepers” and “You Must Have Been A Beautiful Baby”. The Biro was invented. Gas masks were issued to the general public, the Queen Elizabeth was launched, Picture Post was inaugurated. Hitler issued his “Mein Kamf”. Germany occupies Moravia, Italy invaded Albania; the Spanish Civil War ended with Franco triumphant; conscription and the evacuation of women and children from London started. Barrage balloons were erected above London. Germany fatefully invaded Poland on Sept. 1st. 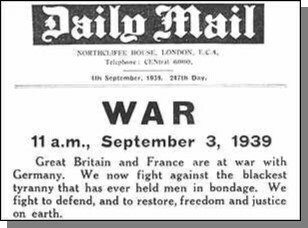 France and Britain declared war on Germany on Sept. 3rd. Roosevelt declared the USA neutral. The British passenger ship Athenia was sunk on Sept. 3rd. The first British Expeditionary Force was sent to France. HMS Royal Oak was torpedoed in Scapa Flow on Oct 14th. USSR invaded Finland. The Battle of the River Plate was played out off the coast of Argentina in December. Surprisingly the world of theatre and arts still ca rried on, albeit briefly, with James Joyce’s “Finnegans Wake”, Richard Llewellyn’s “How Green Was My Valley”, Steinbeck’s “Grapes of Wrath”, Henry Moore’s “Reclining Figure” and Rogers & Hart’s “The Boys From Syracuse”; Wartime songs sprang up including “Roll Out The Barrel”, “Hang Out The Washing …”, “The Last Time I saw Paris” and, bizarrely, “Lili Marlene”. John Cobb set a new World Speed Record of 368.85 mph at the Bonneville Salt Flats. The Sutton Hoo longboat was discovered. The first nylon stockings were on sale and DDT and the helicopter were invented. On the outbreak of World War II the factory was mobilised. 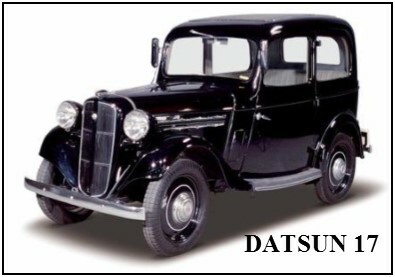 The manufacturing of cars was largely abandoned and the machines were turned to the production of armour-piercing ammunition for anti-tank guns, steel boxes, jerricans, mines, depth charges and helmets. Longbridge also produced parts for tanks, while aircraft were produced at the Austin Aero shadow factory at nearby Cofton Hackett. Fairey Battle light bombers, Mercury and Pegasus aero engines were produced, along with the Short Stirling four-engined heavy bomber and Hawker Hurricane fighters. Nearly 3,000 aircraft were built, along with 36,000 suspension units. Bren guns and mortars were manufactured in West Works. Having such a concentration of wartime production meant that the area was a prime target for bombers. Nearby Erdington was made famous for being the very first part of England to be bombed by the Germans, who had presumably been trying to hit Longbridge.